In November 2013 the workshop by "Made in Cardboardia" (http://madein.cardboardia.info) took part in exhibition "Soviet design"(Moscow "Manege"). 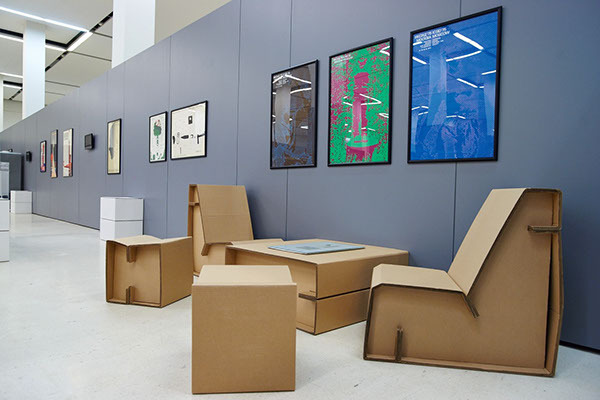 We made reconstruction of furniture of cardboard using the sketches of designer A.P. Ermolaev, amazing in their simplicity and originality of constructivism that correlates well with the policy of our workshop. This chairs and tables was made by Aleksandr Ermolaev for decoration of international forum in Soviet Union times (1975). Developing the miniature town of Cardboardia layout. Every day from 12.00 till 19.00 for kids and adults of all ages. Every year Santa Claus gives presents to kids and adults. But has he ever received any present himself? The Tyran of Cardboardia has made up his mind to make Santa Claus happy by building for him the miniature Cardboard town!!! This town will be beautiful and will definitely have the New Year mood!!! Tyran of Cardboardia invites kids and adults, who are getting presents from Ded Moroz, to pay the tribute and join the construction of the most amazing gift for the most generous personage in the world! 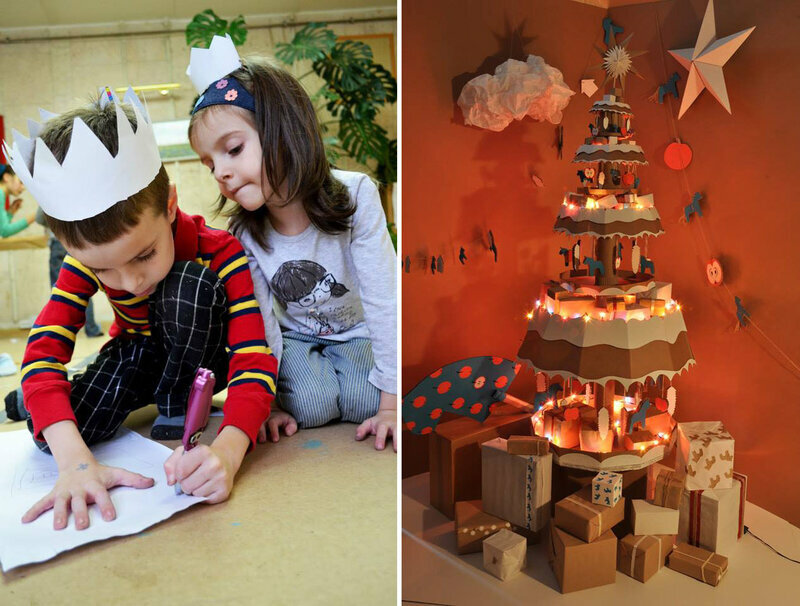 For the period of New Year holidays we would like to invite boys and girls and their parents to the “Made in Cardboardia” workshop! Everyone can fantasize about an image of the town for Santa Claus as well as to learn working with cardboard, find new friends and have a super fun time with the Personages of Cardboardia and personally meet the Tyran of Cardboardia! Tickets can be purchased in advance at the box office of the Meridian Center of Arts and Culture, or on the date of arrival. For the past five years, Cardboardia has mainly grown due to the enthusiasm of its members in finding tools for the development of new areas. The founders of Cardboardia - music producer and journalist Sergei Korsakov (presently the ‘Tyran of Cardboardia’), and legal consultant Victoria Novikova – have come very close to creating an innovative educational program in urban planning for university students. This program is planned to be implemented in cooperation with the Department of Spatial Management of the Russian Presidential Academy of National Economy and Public Administration. The International cultural project called ‘Cardboardia’ has been designed as a country without borders. All participants of the project are actual residents of this unique and amazing country. The construction of Cardboard towns, which usually takes around two weeks in towns and cities in Russia and other countries, is called «Cardboardia town materialisation». As Tyran of Cardboardia told us: «A Cardboard town is a good opportunity to experiment with ideas ». How does the experiment turn into a reality that can profoundly change our lives? We have talked about this with Tyran. During the celebration of Cardboardia National Holidays personages of Cardboardia are always discovering something unusual! 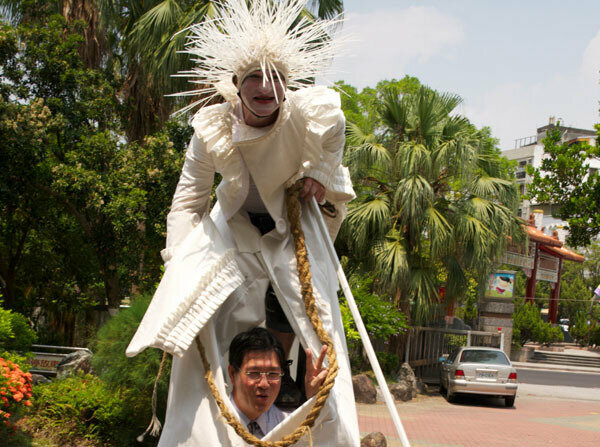 For example, on the Tyran’s Day of Giant Creatures in Taiwan nobody expected that Tyran of Cardboardia would meet an amazing person – Wolfgang Hauck, the homeopathic doctor (just like Tyran’s mother) and, at the same time, the Director of the Die Stelzer Theater from Landsberg am Lech, Germany. This Theater represents a unique combination of classical theater, outdoors environment and actors performing on the stilts. Within the Die Stelzer’ prospective streets turn into a classical theater scene, where the audience turns out to be a part of performance rather than mere observers. 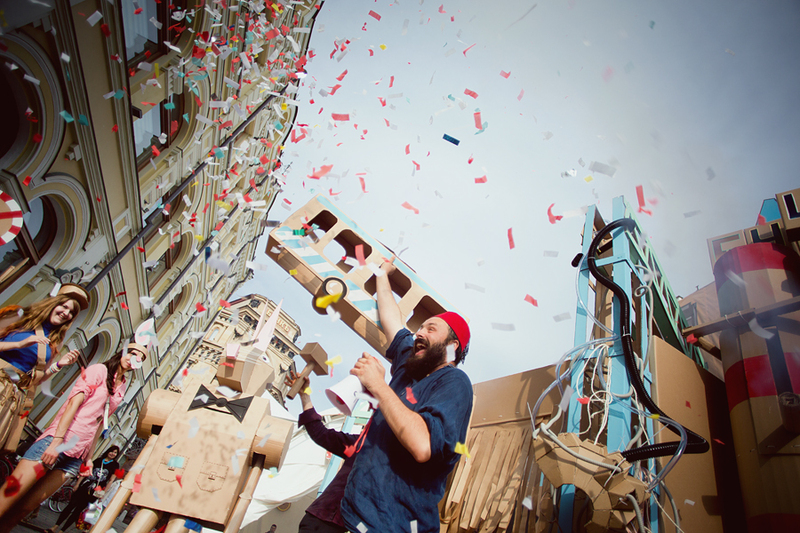 Like Cardboardia the Die Stelzer Theater travels and implements creative projects in different parts of the world. We have asked Wolfgang Hauck to tell us more about recent performances and current projects. Headliner of the program "Design and newsworthiness in urban development" Erwin van Tuijl (Erasmus University Rotterdam) about results of the project and his impressions of the visit to Cardboardia.